"Cheryl's approach to living a more healthy life is refreshing and uplifting, and her stories about her children, who also journeyed with her, are heartfelt and are sure to inspire you toward reaching your goals." 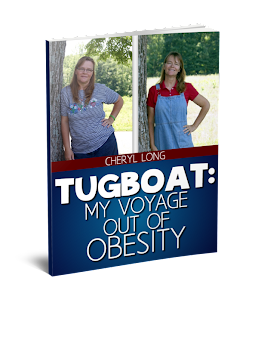 "I greatly enjoyed Cheryl's new ebook 'Tugboat: My Voyage Out Of Obesity'. The honesty and transparency of her journey was so inspiring to me! Her emotional, mental and physical struggles that she faced, as well as how she obtained victory, kept me captivated. I found myself reading the book in one sitting. This ebook is a very easy read, yet gives the information needed for anyone who truly wants to leave a life of obesity. What determination Cheryl has to not only change her life for the good, but to continue with a changed lifestyle! After reading, I am challenged and inspired to make changes myself. I can't wait to try the recipes she shares!" "This book is very easy to read, short and complete. Cheryl shows the reader that they can follow what she has done and get healthy results. Not only does she share her results, she also shares the results of her husband and three of her daughters; what worked and what didn't." "Cheryl's tell all journey is a really good look into what it is like, the up's the down's. Relying on the Lord, Cheryl and her family were able to gain a better sense of mental and physical health. Showing us all that if we try to look deep within ourselves we can have the same resolve." -Jalynn Patterson blogger at A Simple Life, Really? If you're looking for a motivational boost for whatever diet you're on, if you're interested in juicing, or if you just want to read a great story with AMAZING before and after photos, I would highly recommend this book.